Meharry Medical College, founded in 1876 in Nashville, Tennessee, is the second oldest medical school for African Americans in the nation. The college was established by the Methodist Episcopal Church and the Freedman’s Aid Society in 1876 when Samuel Meharry, a Scots-Irish immigrant salt trader who had been helped by a former slave family, gave a $15,000 donation in their honor. The Church and the Society used the donation to establish a program to provide medical training for former slaves. Meharry originally functioned as the Medical Department of Central Tennessee College in Nashville. The department had its first graduate in 1877 and the following year there were three graduates. In 1886 the Dental Department was founded followed in 1889 by the Pharmacy Department. In 1915 the Medical Department received a state charger and Meharry became an independent institution. Hubbard Hospital, named after George W. Hubbard, one of the first faculty members, was built in 1917. 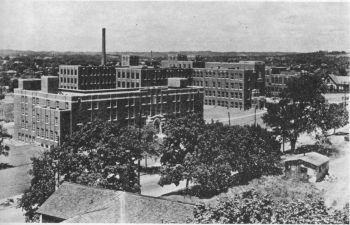 Meharry grew steadily in the first half of the 20th Century. In 1952 Dr. Harold D. West became the school’s first African American president. Under his leadership the campus expanded and another wing was added to Hubbard Hospital. The School of Nursing and the Division of Dental Technology were terminated, but improvements were made in the other schools. Today Meharry Medical College consists of the School of Medicine, the School of Dentistry, the School of Graduate Studies and Research, the School of Allied Health Professions, the George Russell Towers of Hubbard Hospital, two health care centers, and the Harold D. West Basic Sciences Center. Unlike the medical schools at Howard and other historically black colleges and universities (HBCU), Meharry is a private not-for-profit, independent institution. It is also the largest medical college in the nation dedicated primarily to educating black healthcare professionals. Student enrollment is approximately 800, and although its students are from around the world, the vast majority are of African American descent. Ironically one of its most famous graduates, Dr. Hastings Kamuzu Banda, became the first president of the African nation of Malawi. Dr. David Satcher, U.S. Surgeon General from 1998 to 2002 (under both the Bill Clinton and George W. Bush Administrations) was President of Meharry between 1982 and 1993. The primary fields of study at Meharry are Medicine (MD), Dentistry (DDS, DMD), Public Health (MPH, DPH), and Biological and Biomedical Sciences. Some of Meharry’s important student associations include the American Association of Women Dentists, the American Medical Student Association, the Meharry-Vanderbilt Student Alliance and Ewell Neil Dental Research Society. More than 76% of Meharry graduates practice in underserved communities and more than 60% of graduates enter the primary care field. Meharry Medical College, http://www.mmc.edu/ (official website); Reavis L Mitchell, Jr., Meharry Medical College (1876-), http://www.tnstate.edu/library/digital/meharry.htm; StateUniversity: Meharry Medical College, http://www.stateuniversity.com/universities/TN/Meharry_Medical_College.html; BrainTrack College & University Directory: Meharry Medical College, http://www.braintrack.com/college/u/meharry-medical-college; CityTownInfo: Meharry Medical College, http://www.citytowninfo.com/school-profiles/meharry-medical-college.